Stitchex allows you to combine your individual products into a single bundle for your customers to order. As an example, rather than selling a blouse, trousers, shoes and bag as individual products, you can bundle them as a nice ensemble for your customers to choose from. These bundling techniques not only help the customers who may need the extra assistance "mixing and matching" products that work well together but it also expedites their shopping time. To create a bundle, you must have your individual product items (and any associated Raw Materials) already created. If you need help creating Products or Raw Materials, please see our Knowledge Articles for more information. To create a "Bundled Product" (e.g. "kit"), click the blue checkbox above the Product identifier field indicating "This is a product bundle". You may also want your Product Identifiers or Product Names to represent a bundle or kit naming or numbering schema so that you can easily distinguish them from the individual products. As you do with all individual products, specify your season, size and colorways. Then, click "Create Product". Go ahead and add your variations, images, etc. as you would your individual products. There are no changes there. Be sure to see our Creating/Editing a Product Knowledge Article for details. For your Pricing table, you will only need to complete the WSP and MSRP pricing. You will not be presented with a section for Production Pricing as done on individual products (e.g. manufacturing cost) since this is a bundle of products already manufactured. 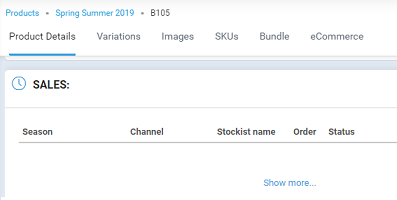 Once you have added your variations and images, click on the Bundle tab for your Product Bundle to begin associating your individual products to this product bundle/kit. Note: This Bundle tab replaces the Raw Materials & Design tabs shown for individual products since Bundled products are not manufactured. From the Bundle tab, click "+ Add Product" next to the Variation/Size combination you want to associate product with. On the "Add Bundle Product" form, specify what products you want to include in this Bundle, then click Save. Repeat this exercise until all individual products have been added. 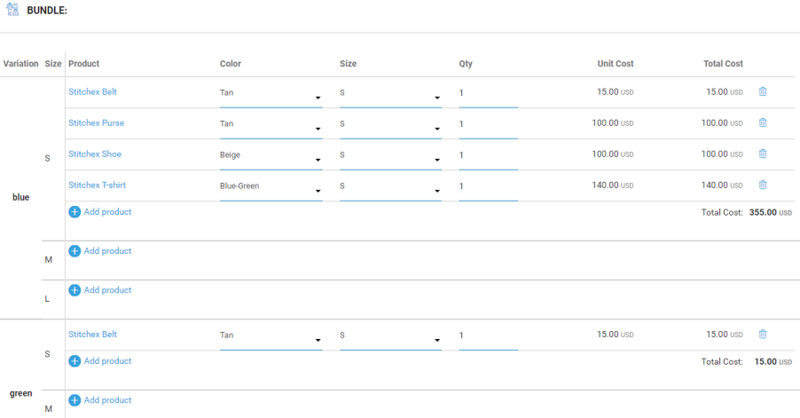 If "All sizes" and "All colors" checkboxes are checked, Stitchex pre-selects size and color according to SKU. Example: Variation - Black XS, Added product Black XS. If you need to add a different size (e.g. "One Size" Hat) of an individual product that is not consistent with your other Product Variants within that Bundle (e.g. 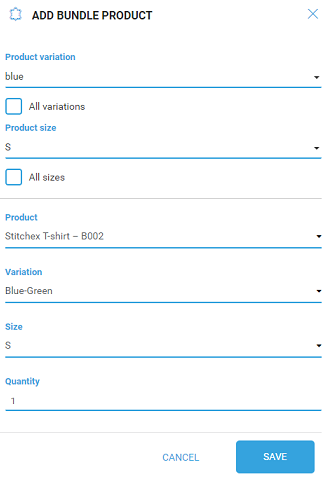 "S, M, L" Shirts and Pants), click the "All Variations" checkbox when you add your "One Size" product (e.g. Hat). (See image above). 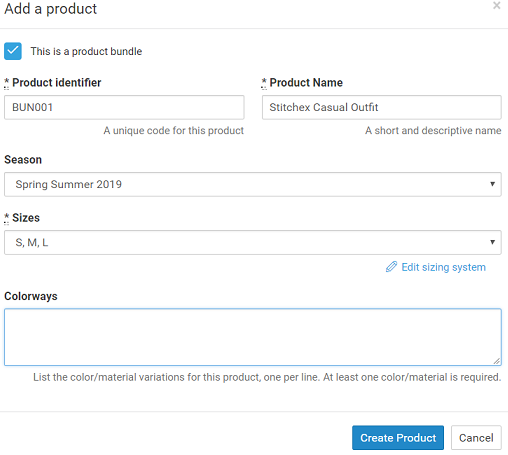 As you add the individual products to each Product variation on your bundle, Stitchex brings over the total Production Pricing (manufacturing total cost) for those individual products. The total cost should help you determine what your WSP and MSRP should be for this bundle. 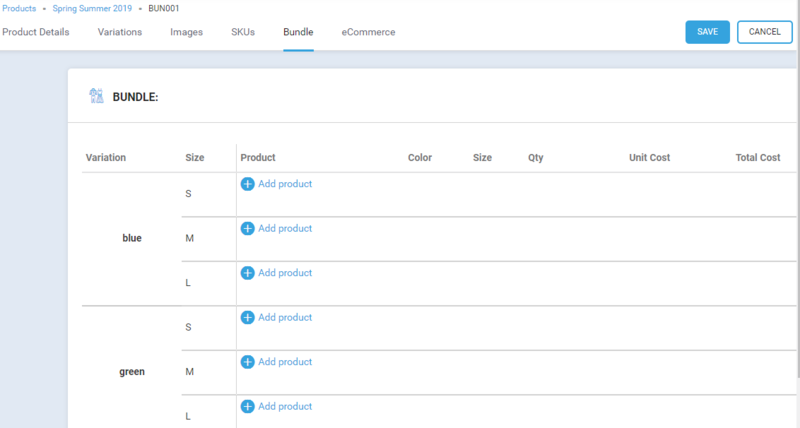 Once you have all of your Product Variations and Individual Products associated with your Bundle, be sure to click the SAVE button in the top right corner for your Product. Your SKUs tab is different on Bundled Products. On Bundled Products, you will not see Warehouse, Warehouse location, Ordered, Production Ordered or Available to Sell fields. You will see Color, Size, SKU #, EAN/UPC, In Stock and Available to Sell. The In Stock and ATS columns will be a minimum value of one of the items from the kit and will not be editable. No inventory will be maintained for Bundled products. your Bundled Kit for these individual products will show In Stock is 100 because it is the minimum stock quantity of the items within your bundle. You would only be able to fulfill the customer order at a quantity of 100. Please also see our Knowledge Article on Manual Inventory Adjustments for additional information on Bundled Products. Combination (Bundled) products are displayed on some Paperwork and not other Paperwork. It depends on the use-case for the Paperwork. The Production Order shows both the Bundled Product and the Individual Products. The Bundled Product will be listed with a quantity of zero just above the Individual Products. In addition, any products with "One Size" across all variants (as explained earlier) will be added together on one row line item. As shown in the sample Production Order below, IndBun003sz is the Product Identifier for the "Bundle" with a Green and Pink variant which is why the quantities are zero. The Stitchex Flare Hat is applied to all variants. It is only listed once with a total of 60 to cover both my Green and Pick requirements. For individual products, continue entering the weight on the Product's variance tab. However, for Bundles, the weight is automatically calculated based on the individual items within the bundle. In the example below, two products within a bundle. One product weighed 30 lbs and another product weight 15 lbs. The Sales Order was completed with the bundle. 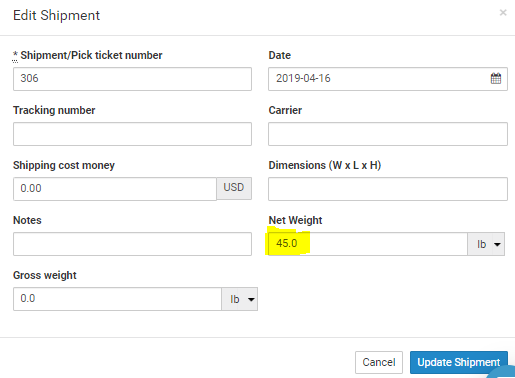 When the Pick List/Shipment is created, in the edit mode you can see the Net Weight is automatically calculated as 45 lbs. You can see your Sales Orders by Product quantities for both your bundled products as well as your individual products. 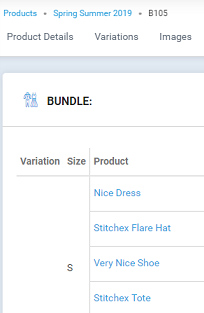 As an example, if my Bundled Product is B105 and includes a "Nice Dress" with Product ID "STCH-DR1" and several other products, I should see the Sales Orders by Product quantities report for the B105 Bundle, the Nice Dress (STCH-DR1) and the other products within the Bundle. To see the Bundled Sales by Product, from the Product Details tab, scroll down to "Sales". Then, click "Show more...."
For Bundled products, this display screen looks a bit different than the individual products. To see the individual product's Sales by Product, from the Product Details tab for that product, scroll down to "Sales". 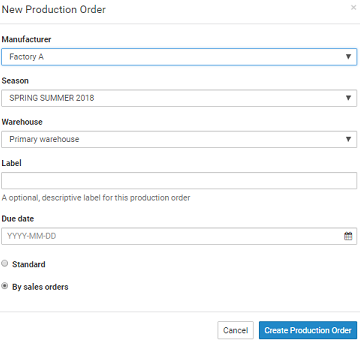 Then, click "Show more...."
Shirt - made from manufacturer "Factory A"
Shoes - made from manufacturer "Factory B"
Hat - made from manufacturer "Factory C"
In the Manufacturer field, select "Factory A"
The only item that will be added to that Production Order will be the Shirt. Repeat steps 2-7 again. However, for #3, select "Factory B". This creates your next Production Order for the Shoes. Repeat steps 2-7 again. However, for #3, select "Factory C". This creates your next Production Order for the Hat.